Once again, J and I were out and about before lunch time and once again, we contemplated Old Dog Tavern. I still really want to try lunch there, but we decided to call before we headed downtown. At 11:05, no one was answering the phone. J tried three times and got a voicemail all three times. We decided not to chance it. Instead, I started heading over to Portage Street. I wasn’t really in the mood for Mexican, but a couple Twitter friends (@mattvandyk and @mobilejray) have tweeted several times about this new place that’s only been open a few months. We had to try it out. El Gallo Blanco is on Portage Street just past the intersection with Lovers Lane. It’s in the building that formerly housed Huarache. We weren’t really big fans of that place and I was worried this new place was just putting a fresh coat of paint on the same business. It isn’t. 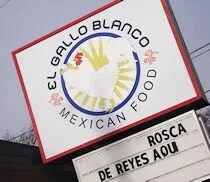 El Gallo Blanco is a new business owned by the same people that run the popular La Perla in Benton Harbor. Other than the building and odd parking lot, there’s not much that would remind a person of the former restaurant. We walked into El Gallo Blanco just a few minutes after 11. There was one other couple already sitting in a booth along the windows waiting for their meal. We were met by a lady who explained that ordering is done up front then the food is brought out. She grabbed a couple menus from the counter then told us to find a table while we looked over the menu. She showed up a few minutes later then asked if we had any questions. The menu is in both English and Spanish and everything is pretty well spelled out, so we were ok. She told us to come back to the counter when we were ready and she’d take our order. While we were looking over the menu, we started in on the chips and salsa. The chips were lightly salted and fried to a blonde color. The salsa is very home made. It’s a thin salsa with large chunks of onions and cilantro among other things. It was good, but not really our thing. 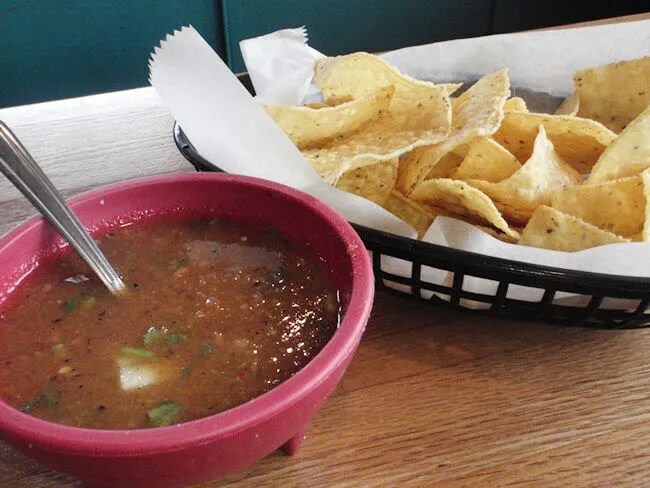 I like a little bit thicker salsa. Just like at American restaurants, I’m pretty predictable at Mexican restaurants as well. I ordered four tacos. There are several options for ordering and stuck with what I like. Steak on home made corn tortillas. They also give you the choice of “Mexican-Style” or “American Style” Mexican style is just cilantro and onions while American style has lettuce, onions, tomatoes, and cheese. I kind of like a mash up of the two with ciltantro and cheese, but I stuck to Mexican style and picked off the bigger chunks of onions. The steak is really tender and wonderfully seasoned with just a little bit of a spicy side to it. The best part was the hot sauce that was put on the table when our meals were brought out. It was a thin red sauce and just a small squeeze into the center of the taco was enough to set our mouths on fire. One of the cooler things about El Gallo Blanco is their choice of drinks. J very excitedly pointed out to me they had Pepsi in glass bottles or “Mexican Pepsi” as we’ve come to call it. They also have Coke in the glass as well. 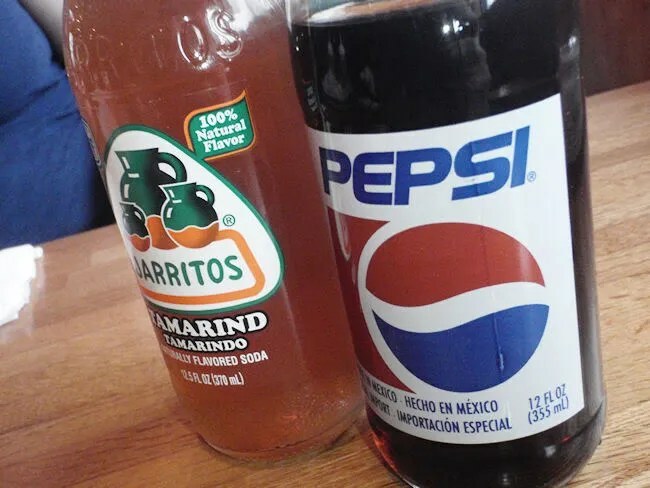 I got the Pepsi, but J’s choice of drink was a Tamarindo Jarritos. The bill for all that food? Just a tad over $14. 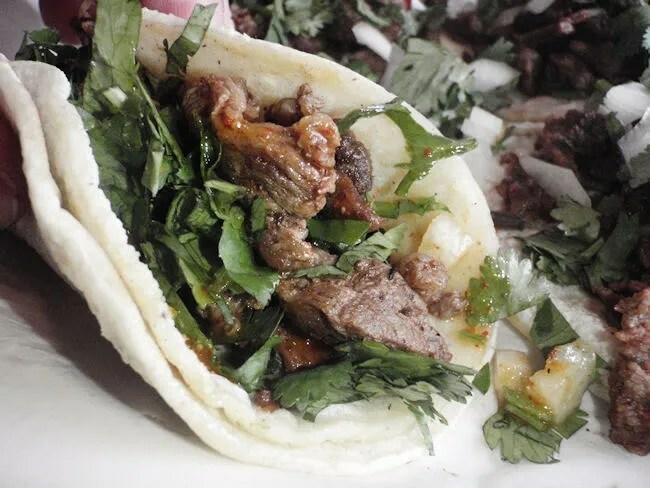 El Gallo Blanco jumps right to the top of my list when it comes to Mexican food in Kalamazoo. The food was fresh and delicious. The service was great as both the ladies we had contact with were friendly and helpful. El Gallo Blanco is a huge improvement over the restaurant that was previously in this location. Couldn’t agree more. 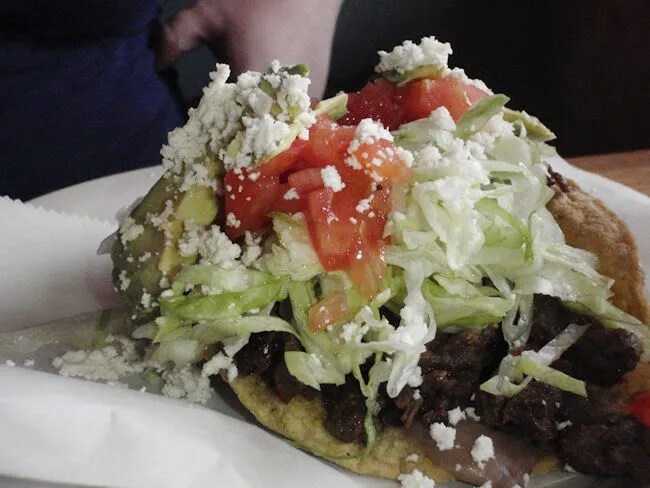 Being from SoCal, my biggest disappointment in the KZO area was the lack of good Mexican food. Everything is great here! This place would do well back home. Plus who can deny the sublet bliss that is mexi-coke. The horchata is awesome too! Great Place…from Cali too and this is our favorite place out here! I will have to try it next time I pass through. I’m always looking for good Mexican food. 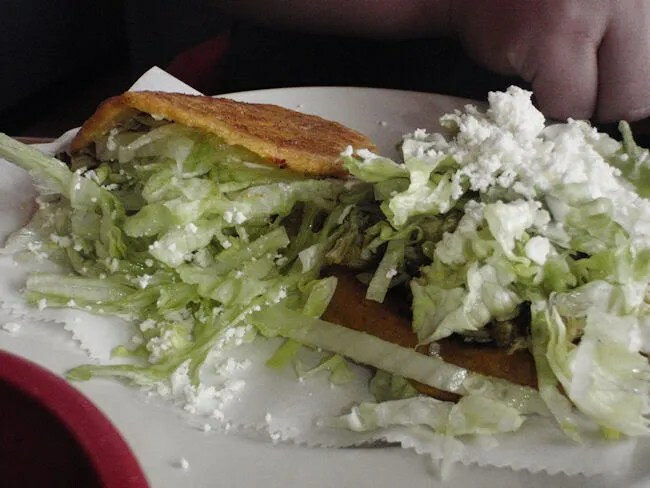 I went to college in Pasadena and I was spoiled by incredible, inexpensive Mexican food. 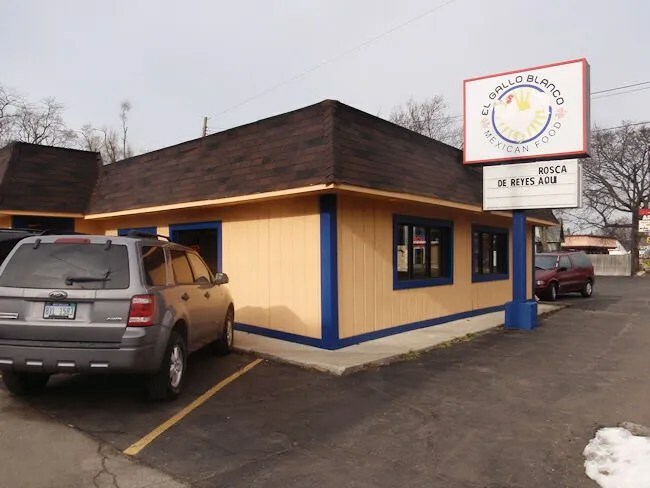 I don’t get to Kalamazoo often, but when I do I always have to hit the Big B…The Big Burrito (5036 W Kl Ave Kalamazoo, MI 49009, 269-372-2442 ) is great when you need something good and quick. They deliver so you can have it brought to your hotel room. For pizza I usually hit Cottage Inn.